I recently received an email from an eminant mathematician, citing errors in a 2008 post in which I listed the 5 polyhedral shapes with regular faces that could be arranged in space-filling “honeycomb” configurations. I went back and reconsidered my earlier survey and realized that I had, indeed, made a mistake. Although I was apparently correct about the number of space-filling polyhedrons with regular faces, one of the examples I gave did not belong in the set: the rhombic dodecahedron. 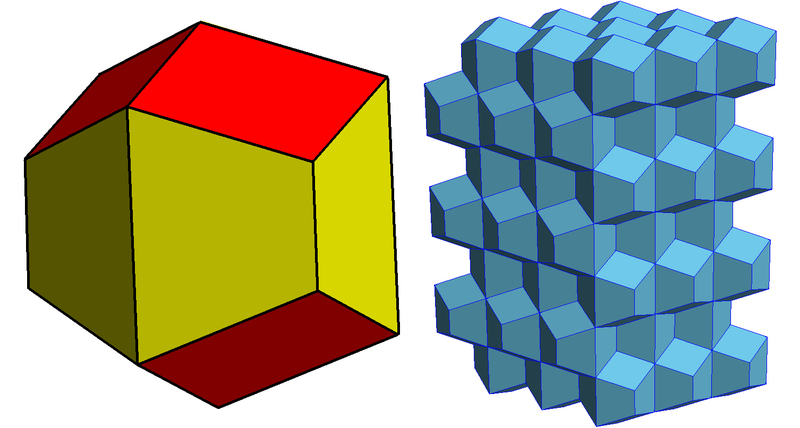 There are only five space-filling convex polyhedra with regular faces: the triangular prism, hexagonal prism, cube, truncated octahedron, and gyrobifastigium. If the point had been that all the faces be “regular,” I should have included the gyrobifastigium—two joined triangular prisms (above). 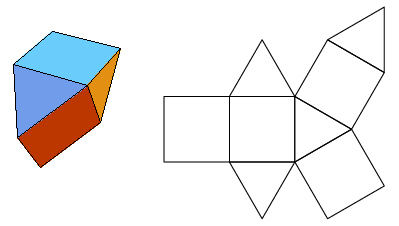 The rhombic dodecahedron (below) while highly symmetrical with identically shaped (congruent) faces, did not fit the bill, since each of those faces was rhombus-shaped and therefore not regular. Really, I should have just omitted “regular faces” as a requirement. For our purposes here, there’s nothing about the squares, equilateral triangles, regular hexagons, etc. that makes these five polyhedral shapes more suitable as packages. If the point had been that the packages should fit together with no space in between, there are many more than five examples. How many? Being careful to avoid contributing any further to the misinformation on the internet… I would have to say, (based on what I read about space-filling polyhedra on Wolfram’s MathWorld site) that the number is in the 100s. At least. Another space-filling polyhedron (with non-regular faces) that I like pretty well is the trapezo-rhombic dodecahedron. 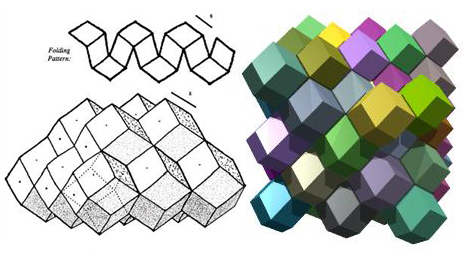 There are also space-filling polyhedrons with concave portions that fit together in interesting, puzzle-like ways. Glad you like the polyhedron with 13 faces. Unfortunately that is not what is commonly intended as ‘space-filling polyhedron’. This polyhedron does indeed fill space but it does it together with its mirror image. A bit like filling space using both of your hands.